Posted February 27, 2014 & filed under Action, Doctor-Prescribed Death, Events, Legislation, News. 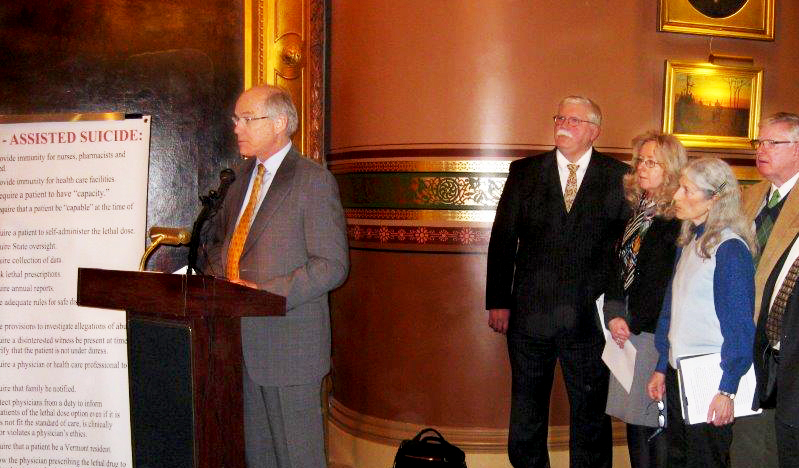 Today (Thursday, February 27th ), the Vermont Alliance for Ethical Healthcare (VAEH) held a joint press conference with the Vermont Center for Independent Living (VCIL) in the Cedar Creek Room at the State House at 1:00pm, on the subject of Act 39, the law that narrowly passed last spring legalizing assisted suicide. It is widely understood that Act 39 lacks numerous protections. VAEH and VCIL called for House and Senate leadership, along with the Executive Branch, to take the responsible course of action and place a moratorium, effective immediately, on Act 39. Spokespersons from both organizations took questions from the media .